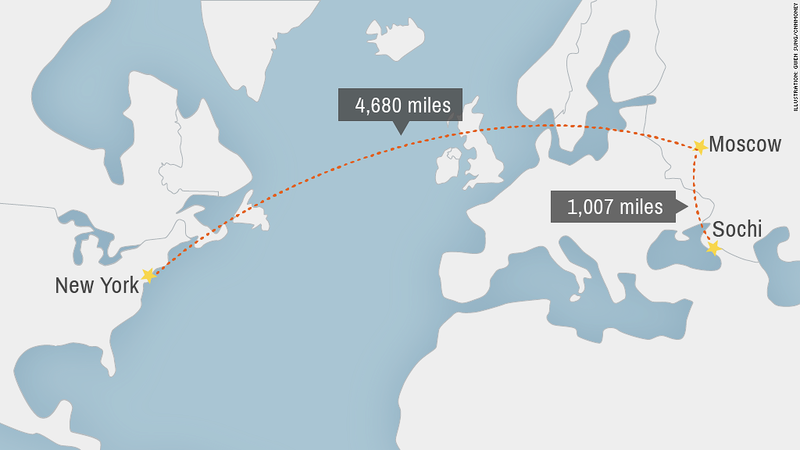 It's a long haul from the U.S. east coast to the Sochi Games. Average travel time is nearly 18 hours and costs have soared. Many American winter sports fans will stay away from next month's Sochi Games, put off by the eye-watering cost and hassle of traveling to the Russian resort. Tour operators say the Winter Olympics, which begin next week, will be the most sparsely attended by U.S. citizens in decades. Little wonder when the bill for attending Sochi -- pegged at $7,000 to $14,000 per person for a week-long stay -- is prohibitively expensive for most. Terrorism threats and anti-gay rhetoric have also put people off. Last-minute travelers will pay about $3,000 for flights, which on average take about 18 hours from New York. Even if you booked early or found a great deal, the flights alone would still cost about $1,000, according to data compiled by travel firm Hopper.com. Once there, visitors face hugely inflated rates for hotel rooms. Protravel International's Rob Rosenbluth says many hotels are charging tourists roughly $1,000 per room per night. Families of Olympians will pay $750 per night. A shortage of rooms means even a mid-range hotel can charge top dollar. Anbritt Stengele, founder of sports tourism agency Sports Traveler, says she booked rooms in a three-star hotel for roughly $700 per night. "There's such a lack of hotels. The hotel operators know they can charge a premium no matter how many people show up," she said. There are no five-star hotels in Sochi, says Stengele, which means many high-flying American tourists have opted to stay home. Related: Is expensive Olympic sponsorship worth it? Then there's the cost of Olympic tickets. Prices for some events are as low as $100, but they can run into the thousands for hockey and skating, said Robert Tuchman, president of sports and entertainment travel company Goviva. Seats at the opening ceremony on February 7 cost between $793 and $1,838. Sochi organizers say 70% of tickets for the Games had been sold by mid-January, and 70% of those had been bought by Russians. American attendees must also have a visa to enter Russia, which costs roughly $300. Applicants are required to provide officials with a list of all the countries they've visited in the last decade, alongside other documentation. "We've gotten the least amount of demand for this Olympics compared to the last 20 years," said Goviva's Tuchman. "We're probably sending around 20 people. On a usual Winter Olympics, we'd be sending well over 200 people." Tuchman notes that Sochi demand is also low because many Americans are opting to save money for a trip to see the 2014 soccer World Cup in Brazil. "Without a doubt, the World Cup is just off the charts," he said. "This will be the largest travel sporting event in the history of sports."